Let’s Compare and Contrast: Human Scale Patterns | whitespace. 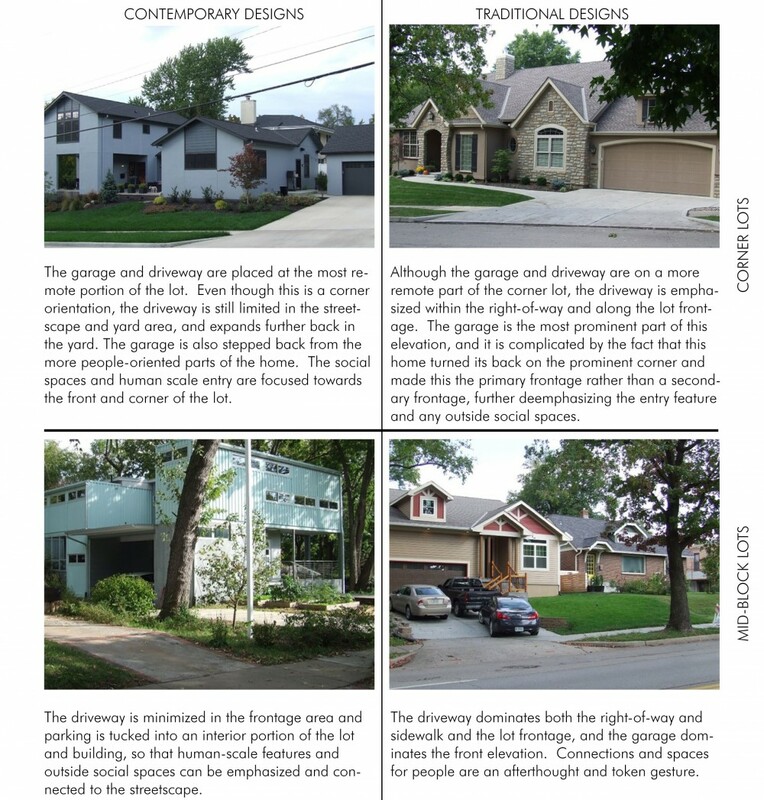 I recently wrote a series of posts on three important patterns of walkable neighborhoods and human scale design – neighborhood streets, understated driveways and garages and front entry features. The observation in this series is that as we try to strengthen “neighborhood character” – whether through investing in established neighborhoods or creating new neighborhoods – we often overlook or ignore these three crucial patterns. We place greater emphasis on superficial aesthetics, or even our own preferences, for a particular architectural style as the source of value and character. While this may impact the marketability of an individual home, these subjective preferences are not the source for building character or greater value in a neighborhood – simple, human scale patterns are. 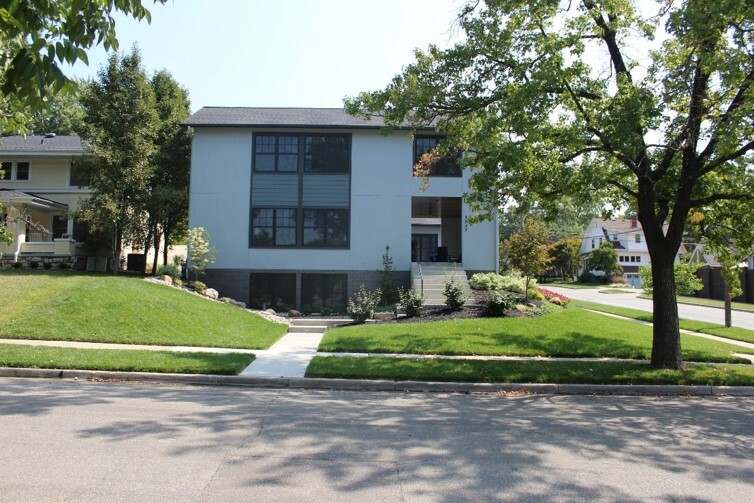 This post puts the three patterns to the test and looks at four recent infill houses in my neighborhood, which acted as the source of my observations. Two examples have more conventional or traditional house designs, but they violate the patterns – in some cases, quite substantially. The two other homes have more contemporary or unique designs, but respect the patterns in their context. One may not like the architectural style or aesthetic of the contemporary homes, but the basic character and value of the neighborhood would not be damaged if these patterns were repeated on a number of lots in a block, despite architectural style. Take a look at the examples in Figure 1 below. Which do you think will be better for the neighborhood? 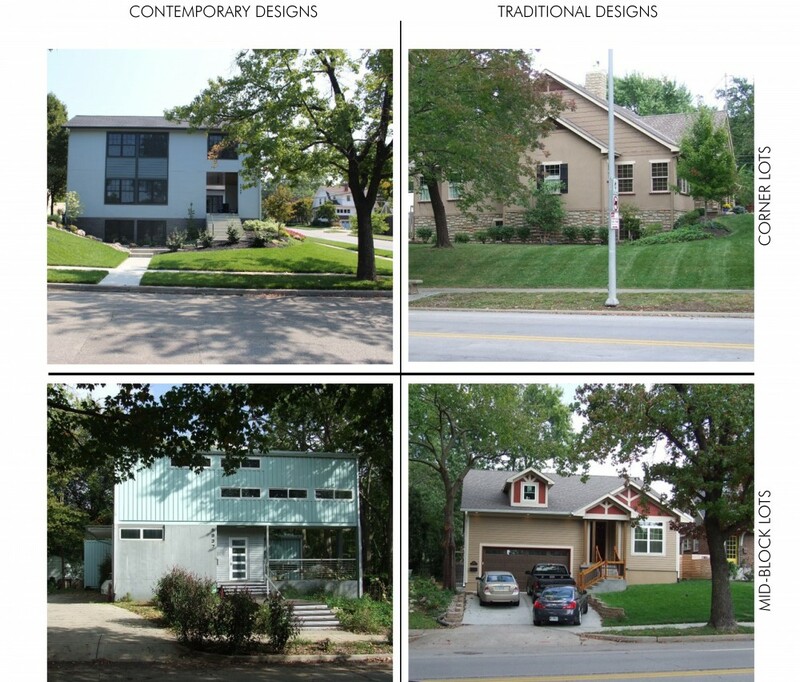 Figure 1 above compares two contemporary home designs, which adhere to the three human scale patterns, with two traditional home designs that do not follow the rules (Image credit: Chris Brewster and Abby Newsham, Gould Evans). The more traditional homes may have wider aesthetic appeal and acceptance on an individual basis. However, they prioritize the owner’s comfort and convenience at the expense of the street, block and ultimately neighborhood character. 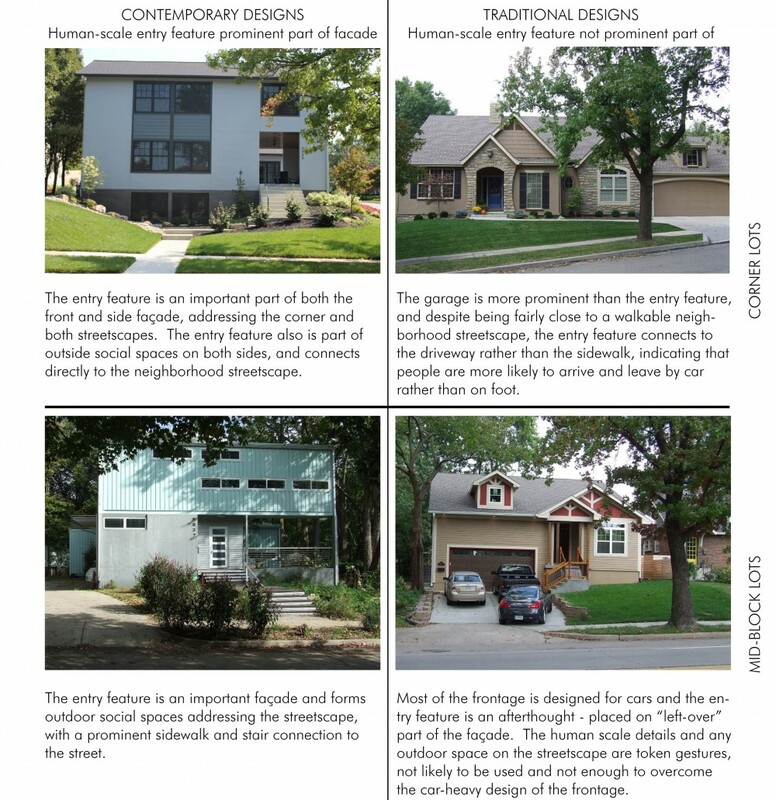 Repeating these homes and patterns along a block or throughout the neighborhood, even though they may have wider appeal on an individual basis, will harm the character and value of the neighborhood as they violate nearly every one of the three human scale patterns significantly. The contemporary home in the example above repeats patterns and respects the neighborhood context. It reorients to the corner with human scale details and social spaces emphasizing the street, and the garage and driveway is at the remote portion of the lot. Despite the style and details being unique to this block, the corner orientation is similar to all other corner lots in the neighborhood. The traditionally designed home ignores patterns and disrupts the context. It reorients to the side street, becomes more garage dominant on the side street, and the entry and details are lost with little relation to the streetscape. Contrast the patterns on all of the opposite corners that emphasize human scale access and details on the corner. 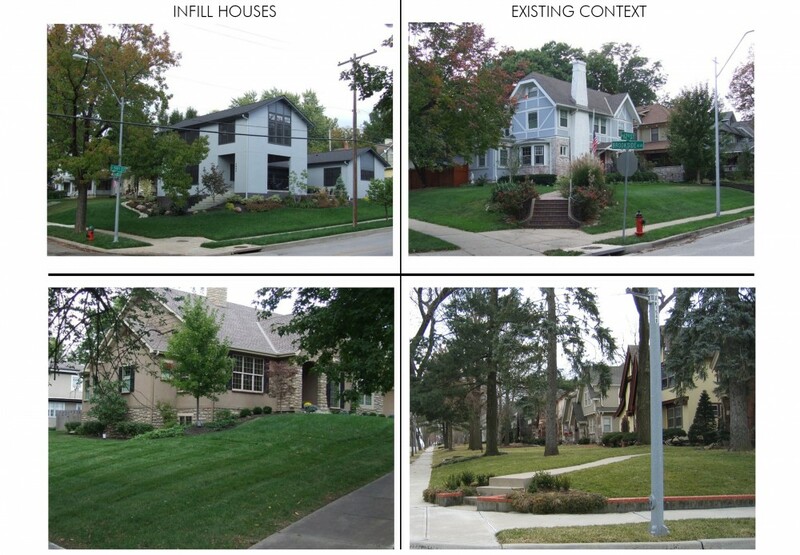 Following the three important patterns of walkable neighborhoods and human scale design is far more important to the value and character of walkable neighborhoods than are personal preferences on aesthetics and architectural style. Side tracking discussions on neighborhood design to these issues, meanwhile allowing the neighborhoods to slowly be designed to accommodate the car and personal conveniences, are far greater risks to neighborhood character and value – in fact they will eventually destroy it. Do you see the three important patterns in your own neighborhood? Share examples in the comment section below.